I love working with brides to create the perfect wedding garter or garter set for their special day. Sometimes their requests present a bit of a challenge, while other requests are pretty straight-forward, but the end result is always fun to see. Here is my latest custom design ~ a Detroit Red Wings flask garter embellished with Mossy Oak camouflage grosgrain. The bride, Kaitlyn, is planning a country-themed wedding with Mossy Oak accents, and I think we came up with the perfect way to incorporate her favorite team with her wedding theme! 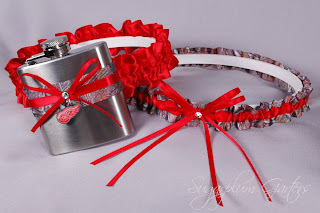 If you are interested in a custom wedding garter or garter set, visit my website and fill out a custom request form.